Your emergency info in the palm of your hand. Android and iOS devices can help save your life in an emergency. First responders and other health professionals will often check for information from your phone, wallet, or purse for any important emergency medical information. 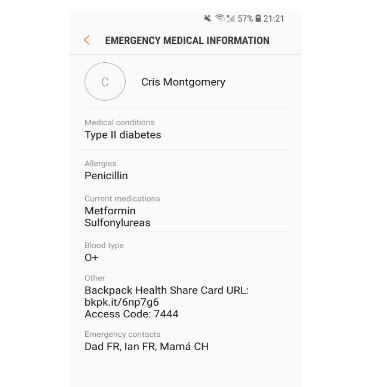 Make sure your phone’s Medical ID is up to date with your current information, and include your Backpack Health Emergency Share Card URL + access code in the note. That way others can have access to important files, images, and documents in an emergency situation when you aren’t able to provide it for yourself or for a loved one. Your iPhone has a Medical ID that is accessible from your lock screen in an emergency. From the lock screen, tap Emergency, and then you’ll see Medical ID. Any information stored there is accessible to emergency personnel, even if your phone is locked. 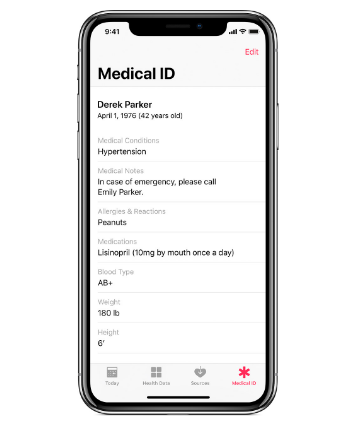 You can edit your Medical ID any time by going to the Health App that comes on your phone and tapping Medical ID at the bottom. You can edit the “Medical Notes” section to include your Backpack Health Emergency Share Card URL or your Health History URL. Medical ID is also available on your connected Apple Watch if you have one! On your Android device, you have your Emergency information that is accessible from your lock screen. From the lock screen, tap Emergency, and then you’ll see Emergency Information. Tap twice to access the information you want to provide. Any information stored there is accessible to emergency personnel, even if your phone is locked. You can edit your Emergency information any time by going to the Emergency information in Settings. You can edit the “Medical Notes” section (or a section similar) to include your Backpack Health Emergency Share Card URL or your Health History URL.